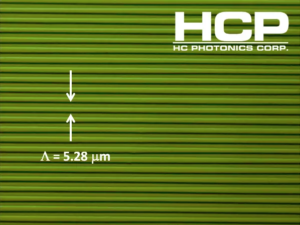 HC PHOTONICS CORP社　PPLN Chips/Bulk Chips　| HCP/HC PHOTONICS CORP社 | レーザー機器　専門商社｜株式会社アルクゥズ　ALQUZE Inc.
HC Photonics has more than 18-year manufacturing experiences of PPLN, fabricated >200,000 high-quality crystals with consistent performance for industrial applications or scientific researches. 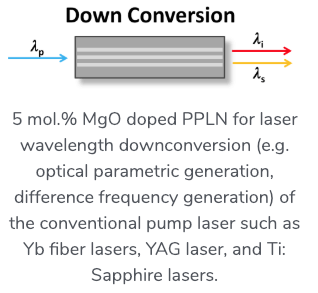 Nowadays, Our off-the-shelf PPLN crystal ranges from ~4um to ~34um are designed for most common wavelengths and applications. Customized patterns are also welcome to meet your application needs. A ferroelectric material can be changed its dipole moment by applying external electric field. This kind of change can be achieved locally by combining with the lithography technique. The key to manufacturing PPLN is the process of inverting the crystal dipole moment and realize a periodically inverted domain structure. The processes start with a 3-inch lithium niobate wafer. 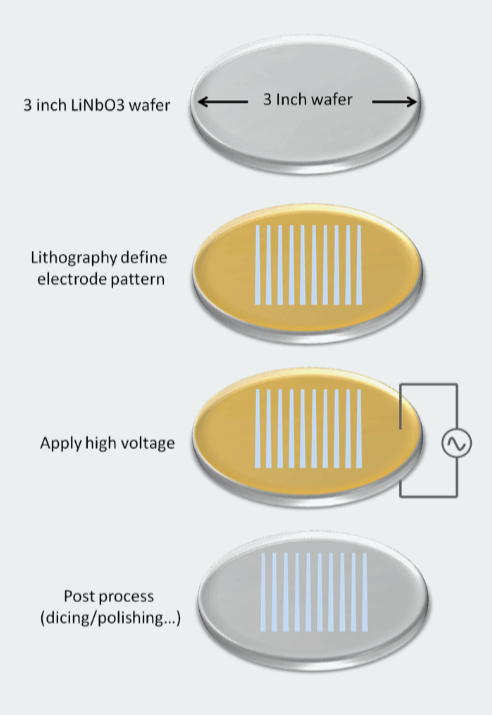 A mask is needed to define electrode patterns on the wafer, and the metal will be deposited after a typical lithography process. The application of a very high electric field (20kV/mm) will switch the position of the lithium ion and niobate ion within a defined domain, forming periodically flipped dipole orientations. The entire poling process is done within only a few milliseconds and the domain are inverted permanently after that. Then the wafer is diced into the chip level with desired chip size for post-processes, like optical polishing and coating, and carefully inspected and packaged before delivery. Period (um) input (nm) output (nm) Aperture (mm^2) Spec. Period (um) input output Aperture (mm^2) Spec. Period (um) input input Aperture (mm^2) Spec. fs-Fanout Period (um) input input Aperture (mm^2) Spec. 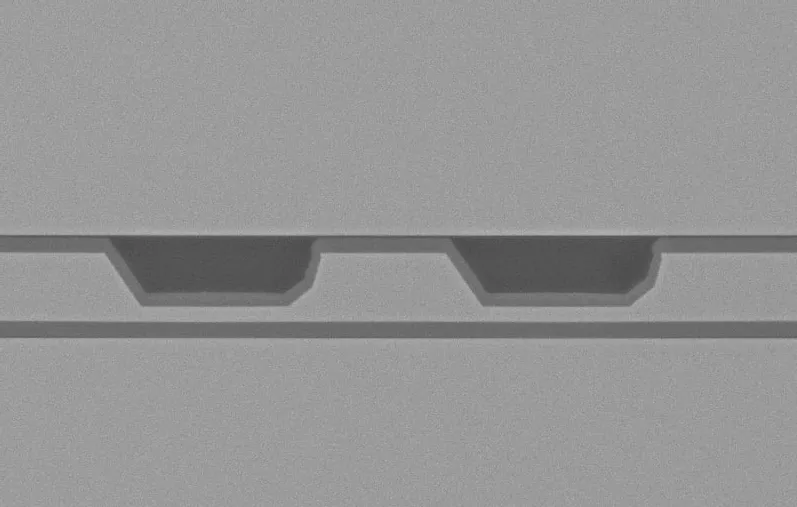 The waveguide can be manufactured on a periodically poled crystal to form a frequency conversion waveguide. HCP provides two types of the waveguide to customers to satisfy the requirement of the different applications. For the more technical introduction please see here. 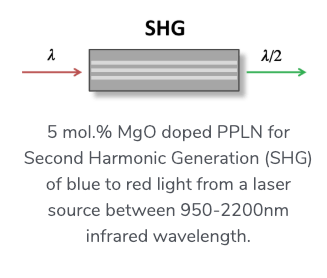 Compared to the traditional ion or proton in-diffused waveguide, the ridge waveguide has a high damage threshold and wide-operation wavelength range due to the high refractive index difference of the core (LiNbO3) and the cladding. The good confinement leads to good conversion efficiency and feasibility of extremely low propagation losses. Most of the waveguides are manufactured upon request, but some of them are available in stock for popular applications. 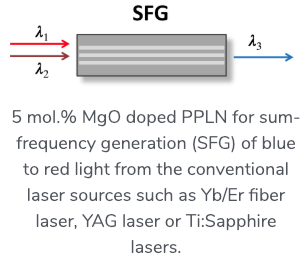 See the typical specification below and just inquiry us with your specific wavelength. 2. Send an inquiry with specified wavelength to us and we will respond you the available waveguide length in stock. 3. For the wavelength not listed, please just send us the inquiry for detailed specifications.